The Merry Commercial rough terrain mower is built extra durable for the toughest mowing cutting with a wide 26 inch deck. The rough terrain mower goes where a riding mower can't. It can mow grass and weeds that are head-high! 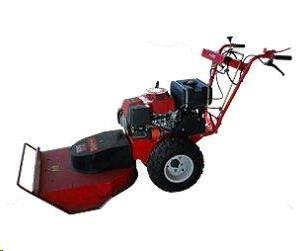 The rough terrain mower features a pivoting brush deck. This allows the rear drive wheels to stay on the ground providing stability and keep the mower moving. The pivoting brush deck also minimizes scalping the ground and damage to the mower. The mower has a rear slip differential for better maneuverability. * Please call us with any questions you may hav about our mower high weed 26 inch rentals in Wayzata MN and the Western suburbs of Minneapolis.